The title may have changed because it is simpler, more accurate and saves on a couple of words – and anyone that has been following my postings knows by now that ‘Lenny’ is the name I have given my COPD/Asthma because my COPD/Asthma is like a constant companion who sometimes behaves and many times does not. I know I have to stay serious about what’s ahead for me and that includes being more serious about my therapy and part of that therapy for me is to put into words how my battle may be going and then sharing it openly as part of what I call my responsibility. That responsibility for my battle is to talk about my travels with ‘Lenny’ and share with others with the hope that maybe, just maybe, I will reach even one other person whom may read what I share and realize they are not alone. Today I once again share where I am at and maybe how I may or may not be dealing with life and my own COPD/Asthma Travels. 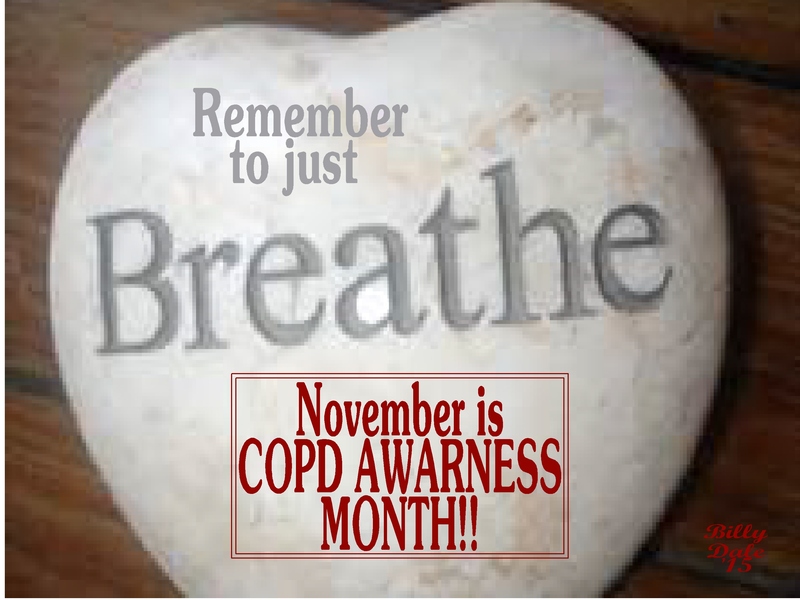 November is COPD Awareness Month – – Remember ‘Without Breathing, One is Without Life’……. If you know anyone with a breathing illness then know that they know they may not look sick but yet many days they live one breath at a time…….. If you know anyone with a breathing illness then know they need respect as well for the battle they battle each and every day…….. If you know anyone with a breathing illness then know they need people too – so please remember them for maybe a cup of coffee, a phone call, a quick lunch or just a drop in visit – just to say I’m thinking of you and hoping you are having a good day and is there anything I could do to help…….. If you know anyone with a breathing illness then know that they know that you should know how important breathing is and should never be taken for granted – which means if you smoke you should stop, if you have children around smoking you should stop, if you work in a toxic atmosphere you should always take precautions…….. If you know anyone with a breathing illness then know you should know that every day you must take a moment or two and just relax while taking several deep, deep breathes and slowly exhale – then say thanx for being able to do it……. If you read all of this then I, as one who does have an everyday battle with that simple thing so many take for granted called breathing, say thanx for reading and please have a road filled with prayers, blessings and steady breathing……..
And that my friends is where “‘Lenny’ & Me are 4 today”. Previous Previous post: ‘Lenny’ & Me 4 Today – – YES I HAVE COPD/ASTHMA!! Next Next post: A Reminder of Being COPD AWARE!